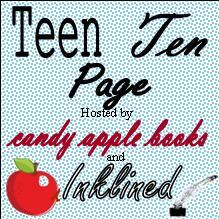 Inklined: Teen Ten Page Contest! Hey guys! My friend over at Candy Apple Books just hit 50 followers, so it's time for a Teen Ten Page Contest. Every four months and every time the blog gets to a fifty follower increment (like 50, 100, 350, 1750, ect.) I'll host this contest. So you enter your first paragraph and then you can e-mail me at sarah(dot)y(dot)faulkner(at)gamil.com. Then, me and my friend Hannah, a fellow teen blogger over at Candy Apple Books will judge the entries and pick two winners. These winners will get a ten page critique by a third party teen, who will change each contest. You interested? This contest opens 12:00 AM Sunday morning! I know, I can't wait either. Each person may only submit one entry. I'll reply when I get it, if you don't hear from me within 48 hours, send a follow up e-mail. If you submit more then one entry per contest, you will be disqualified. If you submit and you have a blog, you need to post about the challenge on your blog or grab the button for your site and never have to bother with posting. If you do post, put the post link in your e-mail with your entry. Your entry consists of your name, your e-mail address and the first paragraph (it has to be shorter then 150 words) of your YA novel or short story. Here's an example of an entry. Below is my entry for the Teen Ten Page you're hosting on Inklined. Also, here's the link the the blog post where I talked about this challenge. www.booklitandstuff.exampleland.com/teen_ten_page.html. Hope to see your entry in my inbox! Yay! :) So who's the judge this go-round? Do you have him/her picked out yet?